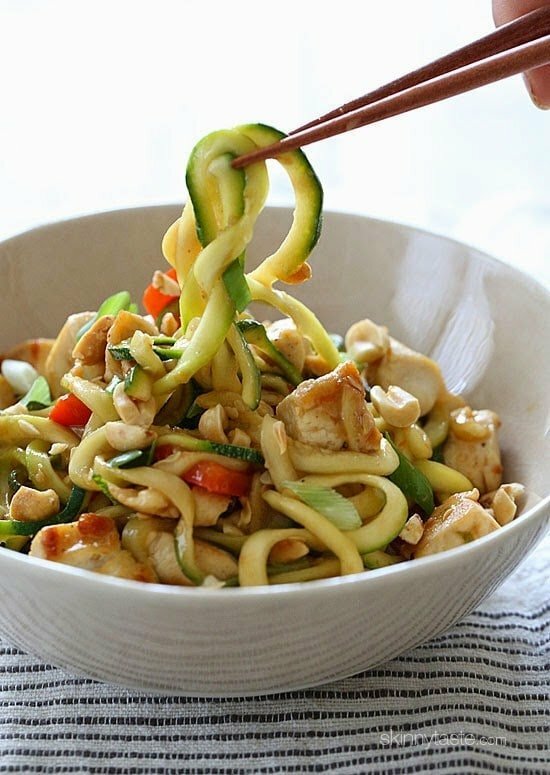 Kung Pao Chicken Zoodles For Two – I swapped the noodles with zucchini noodles and the results were fantastic!! (under 300 calories). Each bowl is filled with chicken and vegetables and the sauce has the flavor combination of of salty, sweet, sour, and spicy flavors. Topped with crushed peanuts – it’s pretty hard to pass this up! If you’re spiralizer has more than one spiral blade, use the thicker setting to replicate a thicker noodle feel. I tested out the Spirooli Spiral Slicer from Bed Bath and Beyond for this and it worked fine, but this spiralizer (affiliate link) is still my favorite. Trim your noodles to about 6 inches long so it’s easy to eat. Since zucchini releases a lot of water as it cooks, I used it to my advantage and purposely left the sauce a little thick. Don’t overcook your zucchini, I cook them for just under 2 minutes. Once the noodles cook and release their liquid, it thins the sauce and works out perfect. Once cooked, quickly remove it from the pan so it doesn’t continue cooking. 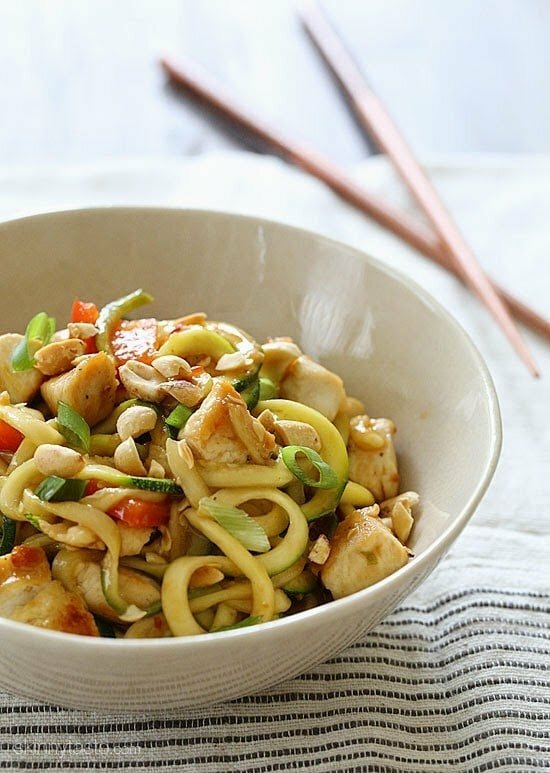 This is such a quick meal – you can easily halve this to make it for one, but if you want to make this for four, I would prep everything and cook it twice rather than doubling it and cooking it all at the same time so the chicken browns, and the noodles fit in the wok. 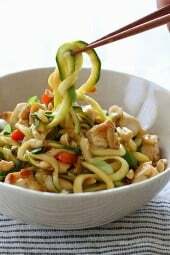 Using a spiralizer with the thickest noodle blade, or a mandolin fitted with a julienne blade, cut the zucchini into long spaghetti-like strips. If using a spiralizer, use kitchen scissors to cut the strands into pieces that are about 6 to 8 inches long so they’re easier to eat. Reduce heat to medium, add sesame oil, garlic and ginger to the skillet and cook until fragrant, about 30 seconds. Add the bell pepper, stir in soy sauce mixture and bring to a boil; reduce heat and simmer until thickened and bubbling, about 1-2 minutes. 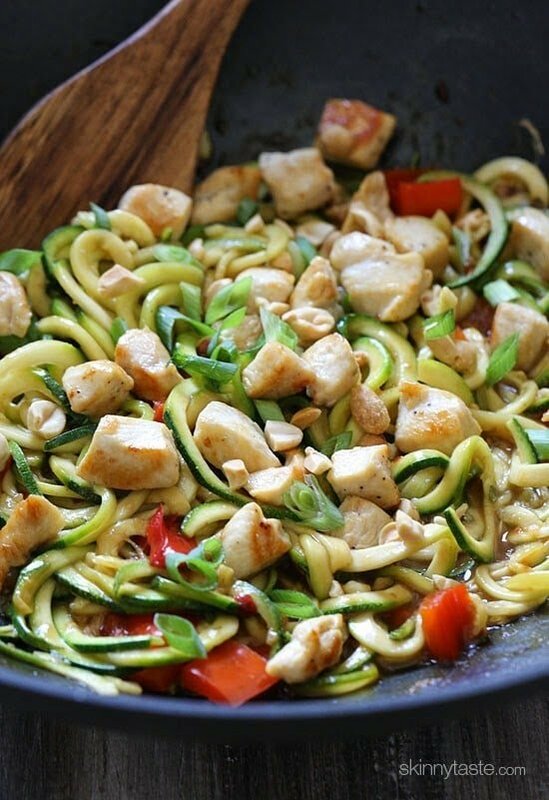 Stir in zucchini noodles and cook, mixing for about two minutes until just tender and mixed with the sauce. If it seems dry, don’t worry the zucchini will release moisture which helps create a sauce. Once cooked, mix in chicken and divide between 2 bowls (about 2 cups each) and top with peanuts and scallions. HI! If I don’t have the Sambal Oleek chili paste what can I sub and how much will it affect flavor? Can you make this with frozen zucchini zoodles? I’m confused over the carb count in your nutritional info. 21 grams seems high, even with hoisin, cornstarch and sugar, since these are relatively small amounts. Other ingredients are pretty low carb – am I missing something? Delish!!!! Made double the recipe, but cut some sugar. Very filling for calorie count. Took me way longer than 5 mins to prep …. Fantastic recipe! Made exactly as written and the flavor was delicious. The texture of the zoodles fooled my brain into thinking PASTA! The sauce was perfect for me, but a bit spicy for my wife (she loved the flavor, just sensitive to the spice.) I’m making this again and will cut back on the chili paste a bit, and add more (or sriracha) to my dish after cooking.Thanks for posting this great recipe! Excellent and healthy and tasty! Going to add onion wedges as well next time and double this recipe as the only criticism I had was there were no leftovers for lunch! I really liked this and I think it is ingenious that you use the natural liquid generated by the zucchini in the sauce. My husband makes shrimp fra diablo using zoodles and it gets very watery…not this dish! I would recommend you try this… I had to buy the red chili sauce and I am not disappointed as this will become one of my fairly regular dinners. Also plenty of food…quite filling, but so healthy! The sauce in this recipe is ridiculously good. We were completely shocked at how much it tasted like restaurant quality Chinese take-out and how easy it was to make. We used chunks of chicken thighs instead of breast and added in large pieces of cut up mushrooms and just love the combination. Definitely another Skinnytaste favorite for us! This is amazing! I used splenda is I’m diabetic and only had green peppers so it’s not as vibrant in color & a little too much of the chili paste but overall I will be making it again & checking out more recipes to try!! My best friend has made this several times and it is one of my FAVORITE recipes! I ask her to make it all the time. Thank you, thank you, thank you! I am reducing carbs and this meal is something I will be making often. I wanted it so badly I wasn’t deterred by not having some of the ingredients. I made my own Hoisen sauce, reduced my own Soy sauce with a little sugar, garlic, and onion. I used ground ginger from a jar, green onions instead of scallions, and red pepper flakes in place of the red paste. Also topped with cashews and sesame seeds. So yummy!! Holy moly, this was delicious! I was not expecting it to be so good! I served it over a bit of rice so that it was enough for my little family of four. Will definitely make again! Ok, so I wasn’t expecting much. Even while I was preparing it I was like, it’s going to be just another ginger, garlic chicken dish, and NO PASTA. BLAaaaa.. WRONG! This was the most I’ve been totally surprised by a light, diet oriented recipe in a LONG time! It REALLY tasted like Kung Pao Chicken, DELICIOUS!!! AND I didn’t ever miss the pasta, not once! I will be making this recipe often and now have hope that weight watcher friendly recipes can be delicious and satisfying. BIG THANKS, Skinny Taste!!! Wow! This was delicious!! This was my first experience with zoodles, and I was really impressed!! Hubby LOVED it too!!! Only complaint…. no leftovers! ? Delicious flavor! Hits the mark when craving asian! I made this over regular noodles for my family and they LOVED it–even my picky daughter who won’t usually eat bell peppers. I loved how filling it was even just over my zoodles! My only thought is that I think next time I might omit the water in the sauce, it was a little thin for my taste and I would like it to really cling to the n/zoodles. Otherwise I would have given it 5 stars–but it’s definitely a 5-star on flavor! Another winner to add my rotation. Great recipe. Everyone in my family loved it. When I put the recipe into Weight Watchers’ recipe builder it calculated 7 points not 5. why the difference? I’ve seen reviewers comment on this same issue in many of the other Skinny Taste recipes, but I haven’t found an answer. Thanks. Great! Made it several times now, excellent recipe. Made this last night 1/31/18 and it was AMAZING. Fabulous!!!! !I will make this again and again.Even delish reheated in the micro the next day! Sorry, Meant to give it 5 stars!!! I made this recipe for the first time and it was so good I shared it on my facebook page. This will definitely be making its way into our weeknight rotation. I never leave comments, but I really wanted to thank you for this recipe. I have never had zoodles before so I wanted to try something that wouldn’t be totally different and wouldn’t scare my boyfriend either. We both loved it… though he did ask that I make it spicer… I added 4x as much chili sauce and some more peanuts for his taste. But this was amazing! I wonder if this can be reheated as leftovers. Anyone try reheating it the next day? Made this last night and it was delicious!! I did have to make some substitutions (used shiitake mushrooms and baby corn in place of red pepper and used sriracha instead of the chili paste), but still so good and surprisingly filling! I’m always grateful to “rediscover” this site when I need to get back on track. I made this last night for my husband and I and it was SO GOOD! My husband doesn’t like zoodles but he loved this.I didn’t use as much Zucchini as the recipe called for which was a bad choice because we couldn’t get enough! The sauce is amazing. Next time I will double it and use half of it to marinate the chicken as the it was super bland… all of the flavors in the sauce made up for it though! Will definitely make again and again. I would like to make this tonight. Is ginger fresh ginger root (minced? grated?) or is is the powered ground ginger spice. Thanks! Hi Gina,. I am making this tonight. Question about the fresh ground ginger…is that fresh ginger root from t he produce section or ground ginger from the spice aisle. Thanks! Realized My zuchinis aren’t very big. Think I could mix sweet potato noodles with it and still have it be decent? Gina…this is AMAZING! I loved the flavors and the serving was huge! I made it exactly as written and will make this again and again. It is my new favorite recipe! Thank you for all the work you put in to these recipes and for sharing those with us! I will be a regular on your blog! Made this for dinner this evening. Very very tasty indeed. will definitely be making again. Hubby loved it too. Made this tonight with a couple of substitutions. I used Sriracha instead of chili paste, corn starch, and sugar and it turned out great! I added a bunch of veggies like onion, multi-colored peppers, cubed squash, and finely chopped carrots and it was wonderful. Also subbed in toasted sesame seeds for peanuts! This was a family winner! ? ?I made some egg noodles on the side for the kids- went perfectly. Couple changes… I halved the sugar – we don’t love sweet so cut the sugar and up’ed the Sambal. Also if your zucchinis are small like mine were, I’d double that as well. Also I doubled receip and it was fine. Another amazing recipe, Gina! My husband loved it too although I did serve his with brown rice pasta instead of zoodles. The flavor is awesome. Going to make this over and over again! My wife is from Holbrook, MY on Long Island and LOVES her pasta! 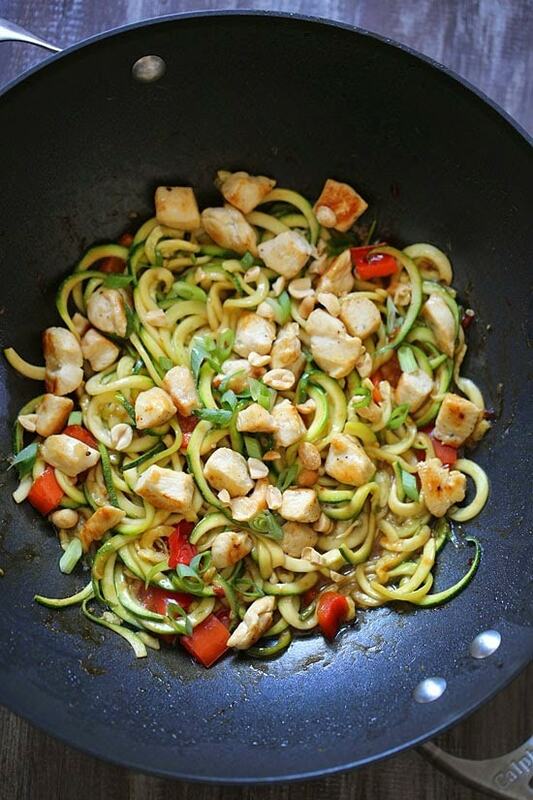 She’s finally coming around to zoodles thanks to you! We’re trying this this week….she also loves her Chinese and it is just so greasy! This is exciting! I can give her two of her favorites without compromising our healthier lifestyle! Awesome! This was amazing! My husband complains every time I make zucchini–until now. He said this is one of his favorite meals! The sauce is so good and the calories are so low. Thank you! We made this tonight and it was delicious! Used ground turkey instead of chicken, and just sliced zucchini thinly because we don’t have a zoodle machine. It worked just fine! Thanks again for another great recipe! What is a good sub for sesame oil? I would need to sub due to a sesame allergy in my family. I should add they also have a peanut allergy. You can use any vegetable oil, you just won’t have the “sesame” flavor. Absolutely delicious!! I made it without the chicken, but served with Chicken Kababs and rice. Perfect dinner!! I am a physiotherapy student and we are doing a health promotion module. We are working with an older Chinese population that have a lot of carbs/ fat in their diet. I was wondering if I could put this recipe on the website we need to make as part of the project. I would make sure your name is on it and I will put the link to your blog on the site. Yes Taylor that would be OK. Just please make sure it is credited and linked back to the blog. Thanks for asking! Made this for dinner tonight and it was delicious! I love all your recipes! I’m doing weight watchers and your site has been a huge help. 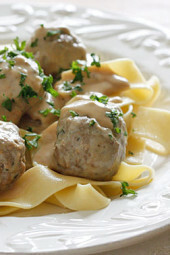 They’re easy, quick and always flavorful! I made this tonight and it was delicious!! My 9 year old tasted it and said “wow, this is awesome”!! Any ideas for a red pepper substitute? I made this with riced cauliflower tonight! So yummy! I love this recipe! I just made this last night, and it was delicious (as always with your recipes). Next time I make it I may try tossing the chicken in the sauce for a minute or so before adding the noodles, just to get them coated. The leftovers were almost even better because it all marinated in the sauce (except, of course, the zoodles were better fresh). I also think you could make the chicken, peppers, and sauce ahead of time, possibly in larger batches, and just warm it up with fresh zoodles anytime you want! This is SO amazing! 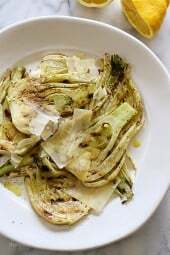 My favorite recipe of yours, and that’s saying a lot as I’ve tried so many of your recipes and liked them all! Do you prefer Paderno or the Inspiralizer? Looking to buy one. I made this with some substitutions — Maca Powder instead of cornstarch and honey instead of sugar — it was wonderful! 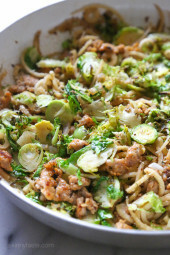 The “zoodles” are a brilliant substitution — delicious — thank you! I have made this twice now in the last 4 weeks for my husband and I. We LOVE it! 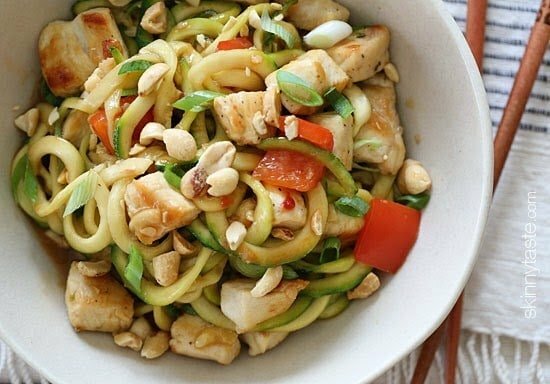 The zucchini noodles are more filling than regular pasta and much better for our healthy eating plan! Last night even my 25 year old son tried it and loved it! Can this be made without sugar/cornstarch or will that affect the flavor too much? This is my new favorite low carb dish. Absolutely delicious. I do add about 4 fresh, sliced mushrooms to it and substitute Swerve for the sugar. Thank you so much for a wonderful recipe!! I didn’t have chili paste so I used Siracha. Then I realized I didn’t have a red pepper (thought I did!) so I substituted red pepper flakes. Not ideal, but guess what? It was still delicious! Made this for myself for dinner and it was so yummy that I ate both servings since I still had calories I needed to eat today to meet my minimum. My only regret is that I didn’t find this recipe 2 years ago when you posted it! Thanks for another winner recipe!! We have a nut allergy. Is there any seed that could step in for the peanuts? We have roasted/salted chickpeas, pumpkin seeds and sunflower seeds in house now. Any of those you will work! I don’t have a spiralizer or mandolin, would it work to just cut lengthwise repeatedly until it’s approximately the right thickness? A vegetable peeler works great! Get the veggetti. It’s $20 and totally worth it!! Using a mandolin takes forever and risks your fingertips! The veggetti is one of my favorite kitchen tools! 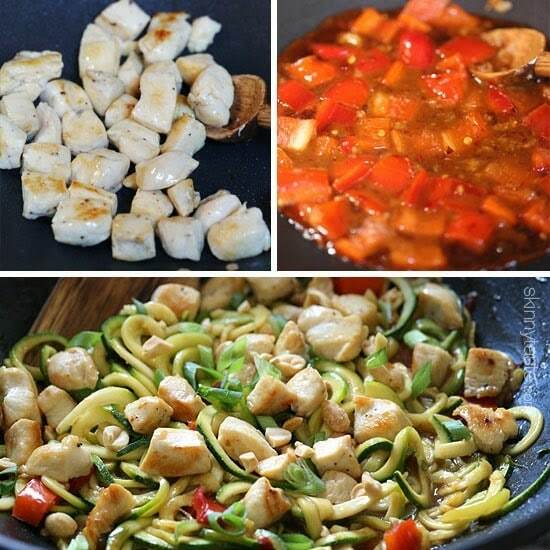 Makes cooking and eating healthy so much easier! Do I reduce the soy sauce or buy it already reduced? The ingredient list for this recipe still states “reduced soy sauce”. Just an FYI! ? You can either but regular soy sauce or a reduced sodium (lower sodium) kind. No reduction necessary. Did you buy the 4-blade or 3-blade Paderno Spiralizer? I have the Inspiralizer now. Just made this and it is amazing!! I’m on a low carb diet and am craving noodles. This made me feel like I was eating noodles. Absolutely delicious and so easy to make!